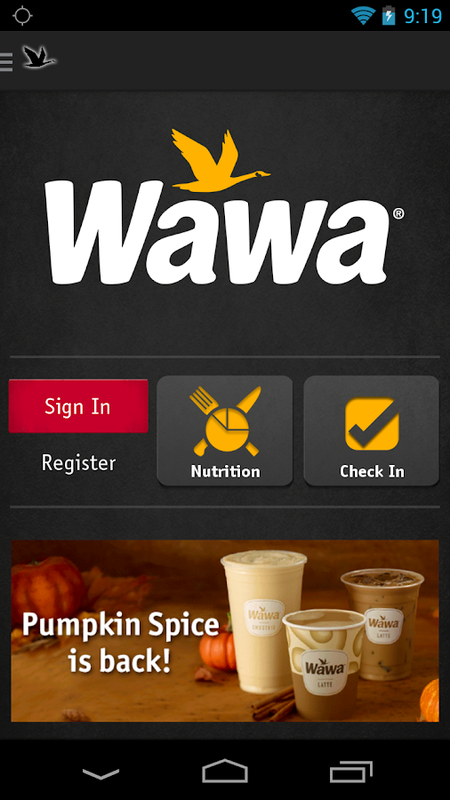 The new Wawa app allows you to do everythingfrom paying with your phone to redeeming your Wawa Rewards. Stayconnected to Wawa in a whole new way! - Manage your Wawa Card: Register a Wawa Card to earn Wawa Rewardsand check your balance. Reload your card anytime. 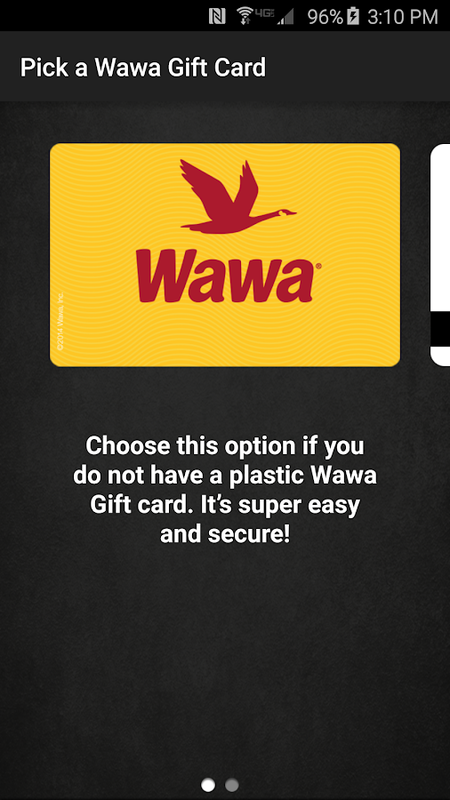 - Pay with the app: Use the app to pay for in-store purchases withyour registered Wawa Card. - Track and redeem rewards: Track your progress to your next WawaReward and redeem in-store. - Find a Store: Find Wawa stores nearest you, get hours ofoperation and directions. 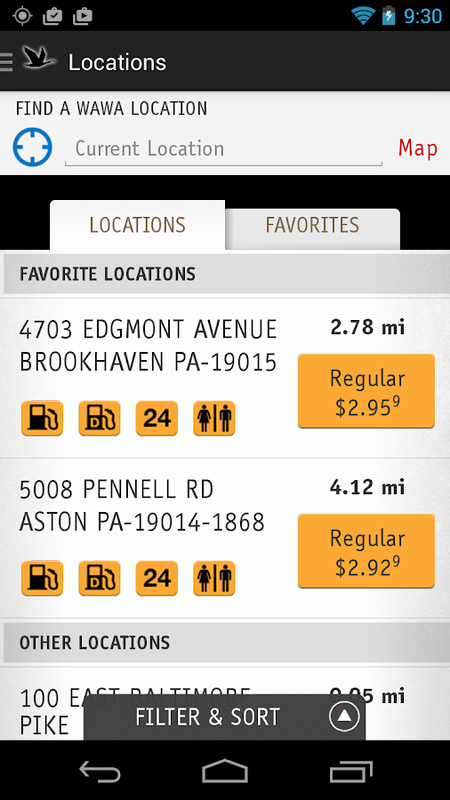 - Check Fuel Prices: Get real-time fuel prices at Wawa fuelstores. - View Nutrition Info: Plan a meal and find out nutritioncontent. The new Wawa app allows you to do everythingfrom paying with your phone to redeeming your Wawa Rewards. Stayconnected to Wawa in a whole new way!Features:- Manage your Wawa Card: Register a Wawa Card to earn Wawa Rewardsand check your balance. Reload your card anytime.- Pay with the app: Use the app to pay for in-store purchases withyour registered Wawa Card.- Track and redeem rewards: Track your progress to your next WawaReward and redeem in-store.- Find a Store: Find Wawa stores nearest you, get hours ofoperation and directions.- Check Fuel Prices: Get real-time fuel prices at Wawa fuelstores.- View Nutrition Info: Plan a meal and find out nutritioncontent. New Redesigned Wawa App! 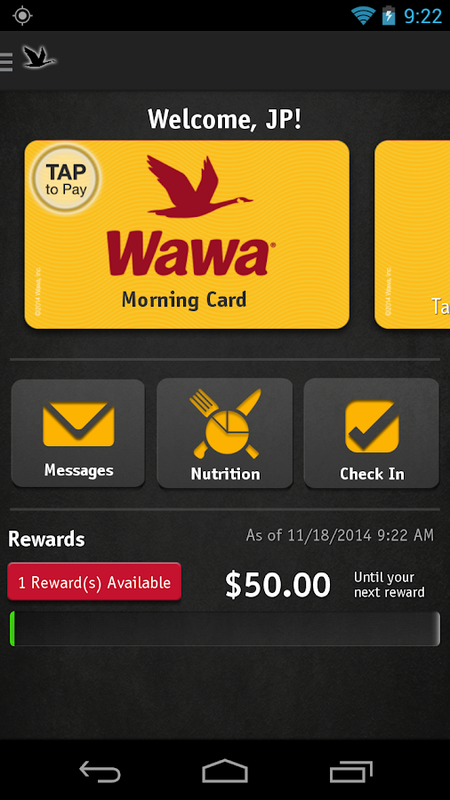 Now it’s easier than ever to order, payand earn delicious rewards with the new Wawa App! Easier toOrder…..with simplified mobile ordering, it’s a breeze to browseour full menu, reorder your favorites or try out something new!Easier to Pay……you can pay for your mobile order with your WawaGift Card right in the app before you get to the store! Easier toEarn…..Now you can pay ANY way and earn Wawa Rewards! Just scanyour new Rewards barcode from your Wawa App at checkout, pay foryour order any way you like (cash, credit, debit, Wawa gift card)and start earning your Wawa Rewards! For every $50 you spend onqualifying items using the app, you earn a delicious reward! Plusyou will receive bonus rewards throughout the year for just being aRewards member! The Honker mobile app delivers the latest Wawa news and updates tothe Wawa community. The Honker makes it easy to see, share,organize and catch up on the latest news and events from around thecompany. Start saving with the Dollar General app today! The Dollar Generalapp gives you easy access to the things you love most about DollarGeneral – our offers and coupons – so you can buy the products youlove and stay on budget. With the Dollar General app you can: •View all available coupons and add/clip coupons to your account •Scan to find available coupons for a product • View our weekly ad,in either a page view or list view format; our list view makes iteasier than ever before to browse our current offers! • Choose yourpreferred store and locate stores nearby with our Store Locator •Browse and shop for products online To view and add coupons, youwill need to create a Dollar General account. Your Dollar Generalaccount can be used for all Dollar General properties including DGGO! and online purchases. CIRCLE K is the one-stop app for finding great deals and earningrewards at CIRCLE K locations across North America! Some greatfeatures you’ll enjoy include: · FIND INSTANT DEALS — Save money onyour favorite products with mobile coupons you can redeem in thestore. · EARN REWARDS — Earn cool rewards by checking in atparticipating locations, or even by telling your friends about uson Facebook or Twitter. You can even win instant rewards. · TRACKPOINTS AND CLUBS — CIRCLE K Rewards members can track pointsearned, view club statuses, and stay up to date on the latestprogram details and sweepstakes. · STORE LOCATOR — Find the nearestCIRCLE K and get directions from your current location, or searchby city or ZIP code. · STORE AMENITIES — See a full list offeatures and services for each location, from car washes and ATMsto menus, special store promotions, and more. · FUEL PRICES — Seecurrent fuel prices for CIRCLE K locations near you. · TELL US WHATYOU THINK — Our app makes it easy to send us feedback on ouroffers, your favorite store, products you wish we’d carry —anything you want us to know. We’re dedicated to making CIRCLE Kthe best and most convenient place to shop, and we can’t do itwithout you! Download CIRCLE K today!